It’s been a problem for many years: how do you know which tram from the Elizabeth Street (Robert Risson) terminus will leave first? At last, thanks to Tram Tracker (and its clone apps on other platforms, such as Android’s Tram Hunter) there is a solution! Just use one of the apps or the mobile web site (or SMS if you’re stuck in 1997) to check for departures from stop ID 3801 (Elizabeth Street at Flinders Street). From what I’ve seen, the information shown is pretty accurate. Trivia: the Tram Tracker icon, Jake the bloodhound, is based on former Yarra Trams CEO Dennis Cliche’s dog Jake. ← Previous Previous post: Trials of new seat covers on Siemens #MetroTrains – will they hide the dirt better? Next → Next post: Ferries and underground railways!! … But why? I can’t fathom why they haven’t put an information screen up on this terminus. It seems like every stop in the CBD has one except the one that needs it the most. This tip has made my morning commute much smoother over the last few months since you suggested it. It’s pretty accurate, although it runs according to timetable not reality, so occasionally it will announce that the 19/57/59 has 1 min until departure, but it actually won’t have arrived yet. Sometimes there’ll be another 19/57/59 waiting at the stop but it’s not the one on the list, but one running late, so confusion occasionally still reigns. However, it’s a damn sight better than what I was doing before, which was an ‘eeny meeny’ choice. Thanks for the tip. The #19 runs every 6 minutes for most of the day. The others are bonuses in between. If you’re journey depends on such small increments of time and is that fundamental to your day, leave a little earlier. While this is an improvement, I have trouble seeing why this is such a big deal. Unless you can’t handle a team leaving in front of you. @jon – They haven’t put them up because they would require slightly different software than the rest of them. Most the screens update based on how far the trams are away from the stop. When the stop is the terminus, which drivers use for toilet stops and presumably change overs, etc then it doesn’t work. It seems to me it shouldn’t be too hard to amalgamate both the “is the tram running on time coming into the terminus” and the timetable information, but according to the Yarra Trams staff member I talked to it would be impossible. Or you know, they could put a timetable up…. @Melbourne Tram Driver – Sometimes I just want to catch a tram up Elizabeth Street. Often just two or three stops. Yes I could walk, but if there are 3 trams sitting there I can assume that one will be departing soon. Unfortunately I’ve got a 50-50 chance of picking the wrong tram, which can be the difference between a 5 and 10 minute journey, or faster than walking vs. slower than walking. Yes its a matter of a few minutes, but the information really shouldn’t be impossible to obtain, at the stop, without having to ask two different drivers. 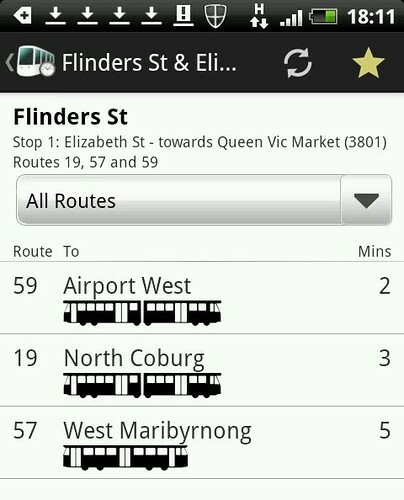 Also, what part of the population that doesn’t catch the 19 Tram regularly knows that they leave every 6 minutes? @Jon, I know they’ve recently switched a lot of the CBD stops recently from SmartGuide to Tram Tracker (there’s some change to the underlying data source apparently). Perhaps part of that upgrade will enable them to put a display at this stop… if they can guarantee the data is accurate. @Niki, glad it’s (mostly) working for you! As I mentioned to Niki a while back, this method is useful if you’re coming in on a train from Clifton Hill, wanting to go up to near Melbourne Central, and wanting to know if you should stay on the train (which may be delayed getting around the loop) or try your luck at the tram stop. @Melbourne Tram Driver, sorry, but I’m going to disagree. Nobody wants to wait at a stop longer than necessary. Even a 5 minute extra wait isn’t great if say you were only going up to the Market – that would double your trip time. And what if you’re travelling in the evening when the 19 runs only every 20 minutes (30 on Sunday nights)? When I was growing up, we used the old Batman Av terminus. It used to have a sign that lit up indicating which was the “Next car”. Yes, this was operated by a human, but in an age when we can get a rover on to Mars, it defies comprehension why we can’t have something as simple as this at Elizabeth St.